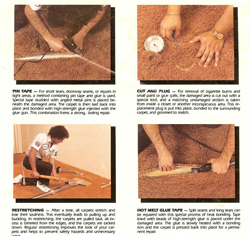 In-between buying a new carpet and throwing out an old one, there is a third alternative: Carpet Repair & restretching. No matter how well you take care of your carpet, buckling happens as a result of everyday wear and tear. Although inconvenient, however, buckling is not a cause for a new carpet. Experts at "A1 Carpet Clean" are able to determine which method of restretching is best-suited for your needs and can keep your carpet in top shape for years to come. With our professional restretching service we can have your carpet looking like new. Also, a wall-to-wall carpet should be regarded as a wise investment that raises the value of the house. Keeping your wall-to-wall carpet in as good a shape as possible is always the right way to go. With our power stretcher and knee kicker we can restretch your existing carpet to ensure that you get the maximum years of use from it. Experts at "A1 Carpet Clean" can also re-seam your carpet if it has been damaged from high temperature heating. Our service ensures that your carpet is stretched as tight as before, or even tighter than before.